Spanish Fork, Utah Home - Harvest Ridge! 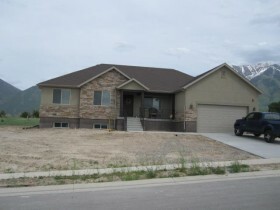 Spanish Fork Harvest Ridge Subdivision Homes for Sale; Search Homes for Sale in Spanish Fork Utah. Our search offers the best online, live search engine in Utah County. The search has listings of all Spanish Fork Homes, condos, and townhomes for sale. When you subscribe to our Buyer's Club you will receive daily emails of every new listing and price change within your search criteria. You will have free unlimited access to every home listed for sale in Utah County. Remarks: Brand New Home, Great Location. Wonderful floor plan. Standard Features: 90% High Efficiency Furnace. Two-Tone Paint. Raised-Panel Alder Wood Cabinetry w/ Crown Molding. Vaulted Ceilings. Ceiling Fan in Great Room. Pre-Wired for High-Speed Internet & TV.